Look out across the forested mountains of Great Smoky Mountains National Park. The mountains are ancient, but much of the forest is young. Very little is old-growth, or ancient—never cut. 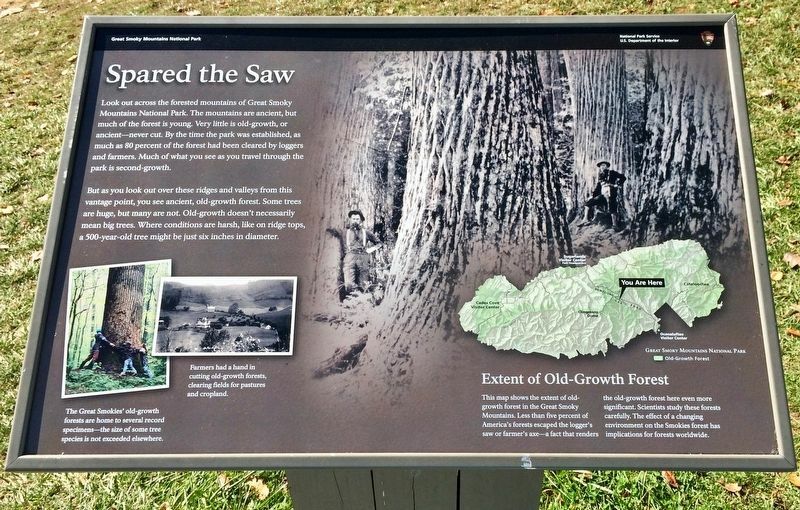 But the time the park was established, as much as 80 percent of the forest had been cleared by loggers and farmers. Much of what you see as you travel through the park is second-growth. But as you look out over these ridges and valleys from this vantage point, you see ancient, old-growth forest. Some trees are huge, but many are not. Old-growth doesn't big trees. Where conditions are harsh, like on ridge tops, a 500-year-old tree might be just six inches in diameter. The Great Smokies' old-growth forests are home to several record specimens—the size of some tree species is not exceeded elsewhere. Farmers had a hand in cutting old-growth forests, clearing fields for pastures and cropland. This map shows the extent of old-growth forest in the Great Smoky Mountains. 2. View of marker and forests beyond. Less than five percent of America's forests escaped the logger's saw or farmer's axe—a fact that renders the old-growth forest here even more significant. Scientists study these forests carefully. The effect of a changing environment on the Smokies forest has implications for forests worldwide. Erected by the National Park Service, Department of the Interior. Location. 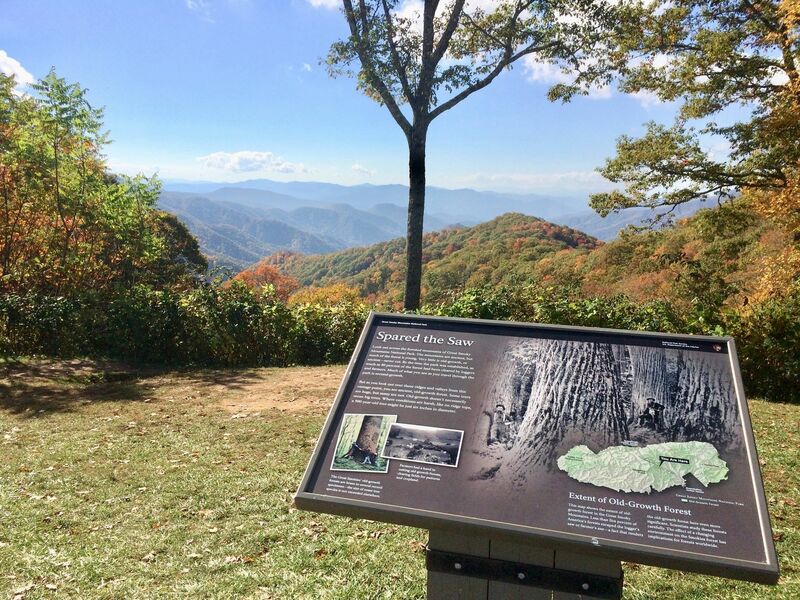 35° 35.686′ N, 83° 24.994′ W. Marker is in Great Smoky Mountains National Park, North Carolina, in Swain County. Marker is on U.S. 441 at milepost 17, 2 miles south of Clingman's Dome Road, on the right when traveling south. Touch for map. Marker is in this post office area: Bryson City NC 28713, United States of America. Touch for directions. Other nearby markers. At least 8 other markers are within 2 miles of this marker, measured as the crow flies. Where Man Is Only a Visitor (approx. 0.4 miles away); Measure of Men (approx. ¾ mile away); Fifty Years of Mountain Logging (approx. one mile away); Land of Blue Smoke (approx. 1.2 miles away); Great Smoky Mountains National Park (approx. 1.2 miles away); People of the Mountains (approx. 1.2 miles away); Land of Diversity (approx. 1.2 miles away in Tennessee); The Great Smokies (approx. 1.2 miles away). More. Search the internet for Spared the Saw. Credits. This page was last revised on October 23, 2016. This page originally submitted on October 23, 2016, by Mark Hilton of Montgomery, Alabama. This page has been viewed 148 times since then and 9 times this year. Photos: 1, 2. submitted on October 23, 2016, by Mark Hilton of Montgomery, Alabama.